Located on Hallmark Dr off Howe Ave, Extra Space Storage serves Sacramento residents near Arden-Arcade, East Sacramento, La Riviera, Rancho Cordova, and more. Locals will recognize our facility near Panda Express and The Habit Burger Grill. 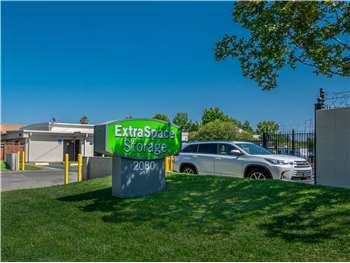 Extra Space Storage is about 2.7 miles from the Cal State Sacramento campus, providing convenient self storage in Sacramento for college students who need storage over the summer or while studying abroad. With a variety of storage units, exceptional security, and vehicle storage, Extra Space Storage on Hallmark Dr is the storage partner you can trust in Sacramento near Arden-Arcade! No matter what you plan to store, our Sacramento storage facility has the perfect space for you! We have unit sizes from 5x5 to 12x45 with first-floor access, drive-up access, and more. To ensure the safety of our customers, our Hallmark Dr storage facility is equipped with 24-hour video surveillance, individually-alarmed units, security access to your floor only, and electronic gate access. Looking for secure vehicle storage in Sacramento? Extra Space Storage on Hallmark Dr has secure outdoor parking spaces and enclosed drive-up units that can handle cars, motorcycles, boats, and even RVs! At Extra Space Storage, we believe our customers deserve the best. That's why we maintain a clean, secure facility at all times. We also have a friendly, professional staff dedicated to providing excellent service. Don't hesitate to reach out if you need assistance. Contact us today to reserve a storage unit in Sacramento! Drive south on Howe Ave. Pass Arden Way and continue south. Turn right onto Hallmark Dr. Our facility will be on your left at the end of the road. Drive north on Howe Ave. Pass Hurley Way and continue north. Turn left onto Hallmark Dr. Our facility will be on your left at the end of the road. Drive west on Arden Way. Turn left onto Howe Ave. Turn left onto Hallmark Dr. Our facility will be on your left at the end of the road. Drive southeast on Arden Way. Turn right onto Howe Ave. Turn left onto Hallmark Dr. Our facility will be on your left at the end of the road.